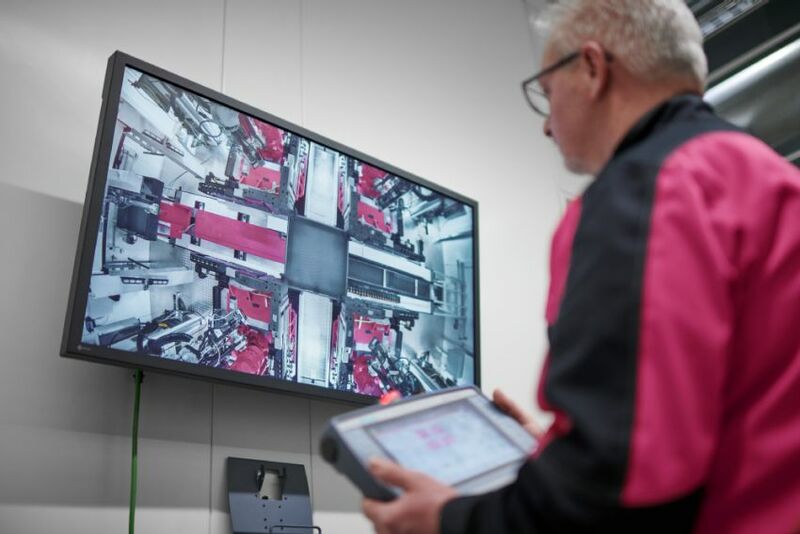 Rittal and German Edge Cloud exhibit 5G Showcase at the 2019 Hanover Trade Fair | Rittal - The System. It is expected that, by next year, 3.1 million industrial robots will be deployed in factories around the world. Connectivity, controlling and maintenance operations pose major challenges for manufacturing companies. Local, private 5G networks in combination with edge computing permit secure, near-real-time communication networks that can be run where production takes place. During the Hanover Trade Fair, Rittal will be presenting an application scenario together with German Edge Cloud (GEC) and Fraunhofer Fokus at the Rittal booth in Hall 11. Using Virtual Reality (VR) goggles and two VR controllers, visitors can manoeuvre a two-armed industrial robot via radio cells linked to an edge-based 5G core network. The task is to plug an enlarged replica of the Rittal conductor connection clamp onto a busbar, then to thread a cable into the terminal and to disconnect it again. This is an everyday task in enclosure manufacturing. Visual and acoustic signals give visitors real-time feedback on whether the task has been successfully completed. In order to grip onto and move objects with the robot arms, people must first be able to realistically estimate the depth and the distances to the robot arms. Two fisheye-lens cameras transmit what the robot sees into the VR goggles as a 360°x180° surround video stream in stereo 3D. The mobile radio connection is made on a frequency of 60 GHz with Small Cells, a small radio cell consisting of base stations with a mobile radio antenna. The 5G cell provides a near-to-reality VR environment and instantaneous robot control. “Companies in the trade know that they have to network their machines and systems intelligently in order to make the most of their industrial data. Together with our partners, we are demonstrating how secure real-time data processing for Industry 4.0 may look. At the same time, the combination of edge computing and a 5G network provides the basis for an intelligent, real-time use of data to create more added value,” explains Dr. Sebastian Ritz, Managing Director of German Edge Cloud (GEC). German Edge Cloud offers private edge cloud infrastructures (Infrastructure as a Service – IaaS), platforms for data analysis (Platform as a Service – PaaS) and industry-specific applications (Software as a Service – SaaS). The network infrastructure for the 5G showcase at the Rittal stand is based on Open5GCore, one of the first globally standardised and manufacturer-independent 5G core networks. It can be used throughout Europe to establish local or regional 5G test networks. The software-based implementation allows network functions to be dynamically combined to create an individual, virtual special network, depending on the latency time needed, the security level and number of devices to be networked. Secure real-time communication is therefore possible in combination with edge computing on site, where the data volumes are processed.